Brooklyn — As in past years, the 6th Annual sale features our hosts wjcohen & Alison, their cutey-pie daughters Lila & Ruby; as well as lovebirds Stinky & Betsy; newlyweds Joy & Rob; newcomers Kristen and Kevin; and of course Sari & yours truly. Though we all miss Stooper Supreme Rebecca (away in L.A. for the weekend), we trust she’ll join us next year at the new Carroll Park location (where wjcohen and his brood are relocating). Alison and Lila once again break out the cookies & lemonade (this time in two flavors), and Lila gains two new assistants, l’il sis Ruby and pal Bella. All that cuteness on display is too much for passers-by and shoppers to withstand, and the goodies are all gone by lunchtime. At the conclusion of the sale, we wake Sari & Betsy from their naps, catch the last somnolent minutes of the U.S/Italy World Cup match, and head over to picturesque Cobble Park for an al fresco picnic dinner. Challenge Item: My entries are three plastic checkbook holders (you know, the ones you get free when you order checks) and a collection of cheap refigerator magnets (you know, the ones you get as promotions from your hardware store and your college reunion committee). I’m willing to sell the checkbook holders for a nickle apiece, and the whole set of magnets for a quarter. Rob is offended by the “garbage” and thinks it brings down the standards of the whole sale. He may be right: shockingly, I get no takers! wjcohen truly scores with his challenge item, an unopened pack of 45 RPM record inserts which he unloads on a middle-aged couple for $1. Later, however, true to form, he suffers a debilitating case of seller’s remorse, sure that he has basically given away a rare collector’s item — new in box! 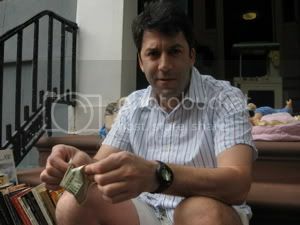 Turns out that wjcohen‘s day is full of challenges, as he also sells a broken DVD player for $1 and a damaged child’s bed for $5 (after refusing to sell the bed for $10). Ladies & gentlemen, I present the new Challenge Item King: Warren Jared Cohen! European Bargain Hunters: Surprisingly light this year, but does the Finnish man who bought the framed poster of the Flatiron Building count? Painful Purchase: In the category of this-hurts-me-more-than-it-hurts-you, after selling Kristen’s wooden table for $15, wjcohen somehow volunteers me & him to deliver it to the buyer’s apartment. We lug the unwieldy thing down the street, up two flights of stairs, and through the narrow doorway — and then turn down the buyer’s offer of a $20 “tip.” We just couldn’t accept it in good conscience — after all, we’ve got reputations as sellers to protect; the moving business is already cornered by Moishe’s. Near Disaster: Joy is kind enough to drive me and Sari home after the sale, but on the way back to Carroll Gardens gets caught in the Grand Army Plaza roundabout and barely escapes with her life. Never again! Big Ticket Item: Expert Stooper and ultra-streamlined Stinky unloads his single item, an old dresser, for $20! With this sale, Stinky announces his retirement, going out on top and refusing to “stoop” to my checkbook-holder-refrigerator-magnet level. Jerk! Total take: $75. Using wjcohen‘s accounting method, given that I woke up at 6:30 a.m. and we dropped off the unsold merchandise at the Salvation Army at about 5:30 p.m., that comes out to almost $7/hr. Not bad for a summer job! Wonderful entry, as always….and thanks for the shout out. I learned all my challenge techniques from you. Special designation should not only apply to Josh’s sun prevention plan but his stamina in general. I think he was on the sales floor for the duration of the event, unlike the nap takers, soccer watchers, treehouse players (yes Lila, this is you) and sandwich fetchers (how far do you have to travel to get a Vietnamese sandwich anyway?) Josh is employee of the month for sure! Like every year, it was tough to tell the sellers from the buyers. The amount of internal horsetrading meant that most of us took home more than we sold. (Coming: a pix of the baby blue tuxedo shirt and jacket donated to me from Rob. Will sure come in handy when I’m invited to my next formal bris.) Josh and Sari had a cart o’ stuff piled so high it looks like they were peasants going back to Anatevka. 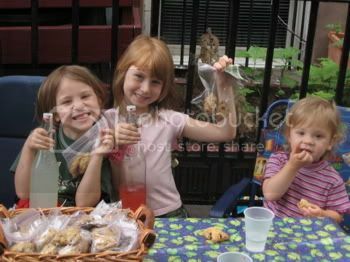 Maybe the lesson is that next year, the stoop sale should only sell cookies and lemonade?!? 4eyez -this was fun (the entry – i didn’t go to your sale. maybe next year i can partake and sell my wares? mr. cohen, not to rub salt in the wound, but i agree, you lowballed on the 45 inserts. live and learn. glad you enjoyed the post, which i must confess is mainly geared toward my fellow sellers. but you’re welcome to join the group next year. i’ll keep you posted as to our plans when spring rolls around again. hard as it is after each sale to believe there will be stuff to sell next year, somehow the boxes and junk pile up, and there we are again needing to purge. Can I get in on the magic too? 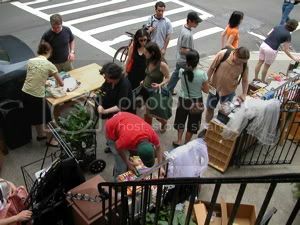 I haven’t had a good sale in 2 years, not since I moved to the current Butler Street pad and unloaded the “kitchen trousseau” I’d been traveling with since breaking up with a live-in boyfriend. When did I think I was going to do all that baking?? I decided early this season that, with the exception of 2 American Apparel skirts, some sandals and the occasional band tee, ALL my summer clothes are going to come from stoop sales. are these two gals the ones joining us for this year’s event-o-rama? After failing with my Challenge Items the last two years, I’m offically ceding that category to you. May you reign uncontested. Oh, and Stinky did find his pen. It was at the bottom of a clothes box, and by the time it was found, the sale was over. P.S. Thanks for the price correction on the record inserts; it’s been amended. Was there no X-man paraphernalia up for sale? Josh’s old Colossus under-roos, perhaps, or his Halloween plastic-strap-on “titanium” claws? I would expect no less from uber-fans disappointed at the sell-out sensibility of X3. Anon, I totally agree with you about X-3, but the only X-Men bauble I own is a super-deformed Wolverine, and there’s no way in hell I’m partin’ with that, bub! ← Brooklynites: Buy my stuff!